Obituary – Craft, Mark Alan « Perry High School Alumni Association, Inc.
Jr. Class Vice-Pres. 62-63; Football 61-64; Basketball 61-64; Baseball 61-64; Track 61-63; Letterman 61-64; F.T.A. 63-64; Chemistry Assembly 62-63; Christmas Vespers 61-62. Mark Alan Craft, 20, 733 Ivanhoe street, was killed in a two-car accident a half mile west of I-35 highway on U.S. highway 64-77 and a mile south on the Perry lake road. Rosary for Craft will be at 7:30 p.m. Friday at the Newton chapel. Funeral mass will be at 10 a.m. Saturday at St. Rose of Lima Catholic church with burial at Mount Carmel Catholic cemetery. The services will be in charge of Rev. Anthony Dockers, pastor of the Catholic church. to return to CSC this fall. He was a member of the Catholic church. 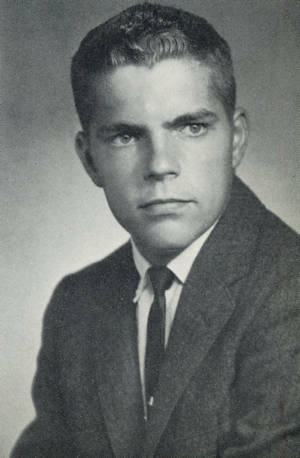 During his school career in Perry he was active in football, basketball and baseball from 1961 through graduation. He was a member of the Lettermen’s club each year during that time. He also went out for track in 1962-63. He served as co-captain of the basketball team in his senior year, was vice president of his class in his junior year and was in the senior play. Besides his parents he is survived by one brother, Rick Craft, Kansas City, Kan.; one sister, Miss Rebecca Craft, Oklahoma City, and his maternal grandmother, Mrs. Carrie Lindeman, Perry.